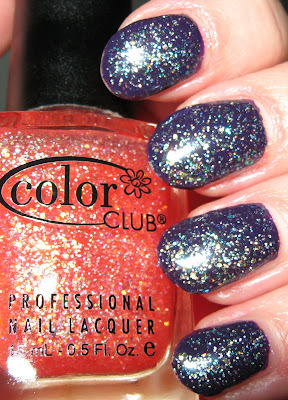 Above & Below: Calendula for Joy shown using 3 coats. Above picture is with no flash under an Ott light, below photo is with a flash. 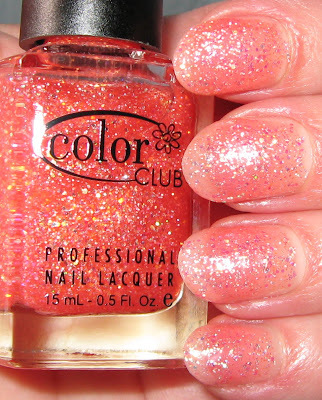 Below: 2 coats of Calendula for Joy used as a top coat over Orly Wild Wisteria. Below: As long as we're experimenting, here is the look after a matte top coat. 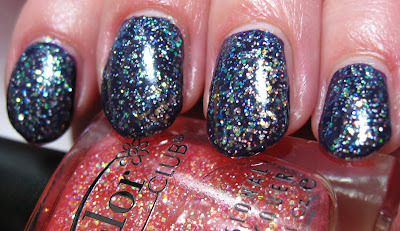 This evening I have for you the third of eight Color Club Exclusive Japanese Glitters that are new to Victoria Nail Supply. 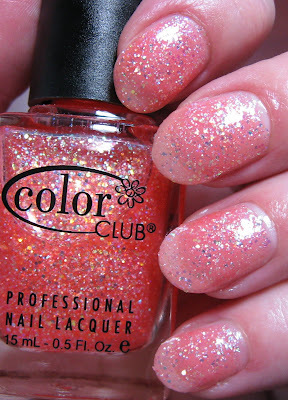 Calendula for Joy is most similar to Twinkle Peach, although it's actually got more of a peach tone than Twinkle Peach! Names can be deceiving though. You can see Twinkle Peach along with I Love You in the post below this one. Calendula for Joy is quite sheer, much like Twinkle Peach. I used 3 coats, but it's quite obvious in the photos that many more would be needed for an opaque look. As I mentioned earlier, some of these are better suited used as a top coat over another polish, or as a base coat with another shade over them. I'll be working on swatches of the remaining 5 shades for tomorrow's posts, as well as showing some of them as both base and top coats. Oooo, I love that matte!!! I ordered all the Japanese glitters. Hope they are all pretty. 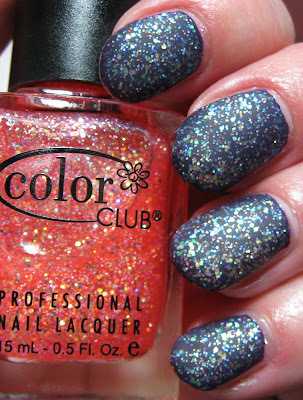 This one is gorgeous as a topcoat. Looks fantastic over Wild Wisteria. I also love it matted. Hope you gad a wonderful Christmas. gothique~they're pretty different from other polishes. I'm glad to see more color in this set. gildedangel~I think glitters always look so pretty with a matte coat. Very different. Lucy~can't wait to hear what you think of them. We had a nice Christmas, thank you. Hope you did too! Tuli~hope you get some! Yes, some of them are a little too opaque, but they'll be used more for base or top coats by me.